Dental veneers are ultra-thin shells of porcelain which are bonded to the front of the teeth changing their shape, size, or color. They are used in order to correct specific dental issues including uneven tooth alignment or spacing, tooth discoloration, chips, cracks, worn tooth enamel, etc. They can be made from porcelain or from resin composite materials, however, porcelain veneers (also called dental porcelain laminates) not only resist stains better than resin veneers but they also mimic the light reflecting properties of natural teeth. Dental Veneers treatment provides patients with permanent, award winning smiles. At VF Laser Clinics' medical team knows how to create white and harmonious straight teeth with state of the art cosmetic dentistry! Done in just 2 Clinic Visits! 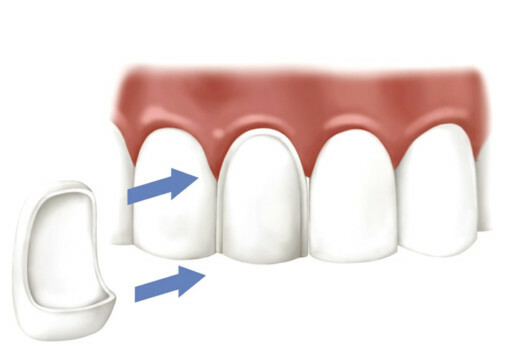 Porcelain Veneers are composed of a Biocompatible Material. Porcelain Veneers are 100% Natural-Looking.